This sweet style takes its name from a hand-drawn pine wreath that forms the "O" in J-O-Y, which is spelled out big and bold with accompanying antique capitals. The pretty, lighthearted wreath is always green with a sprig of holly accent but the J & Y around it are offered in red, gold or matching forest green. Your names or an additional greeting are typeset in a whimsical, fountain-pen style script. Joyful Wreath holiday cards also feature a square four-panel grid for your photos and fun abstract polka dot art on the back, Customize your Joyful Wreath holiday coasters today! Joyful Wreath holiday coasters are available in several shapes—3.9" round, 3.9" square with rounded corners, and others. They are printed on extra-thick (58-point) paper board. To give you an idea of how thick they are, a stack of a dozen coasters are around 3/4" tall. They are made of absorbent pulpboard to help protect your tabletop. The coaster top is coated with a smooth matte coating to provide beautiful, crisp printing. 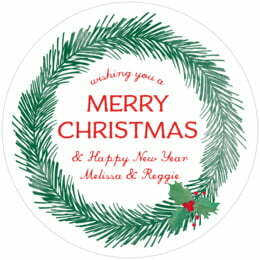 Holiday coasters are individually die-cut, so their top has a soft and rounded edge. They are designed to be disposable, but they are durable and re-usable. If unused, they can be kept as keepsakes and will last forever. Holiday coasters are printed on one side only. On the blank back, a small Evermine logo is tastefully debossed. Holiday coasters come beautifully packaged in boxed sets of a dozen; they are great to give as a gift for the host and hostess when you attend a holiday party elsewhere, or if you are the host, hand them out to your guests or scatter them on your tabletops. 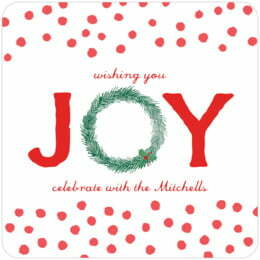 Choose a desired color and then select "Personalize" to start customizing your Joyful Wreath holiday coasters today!